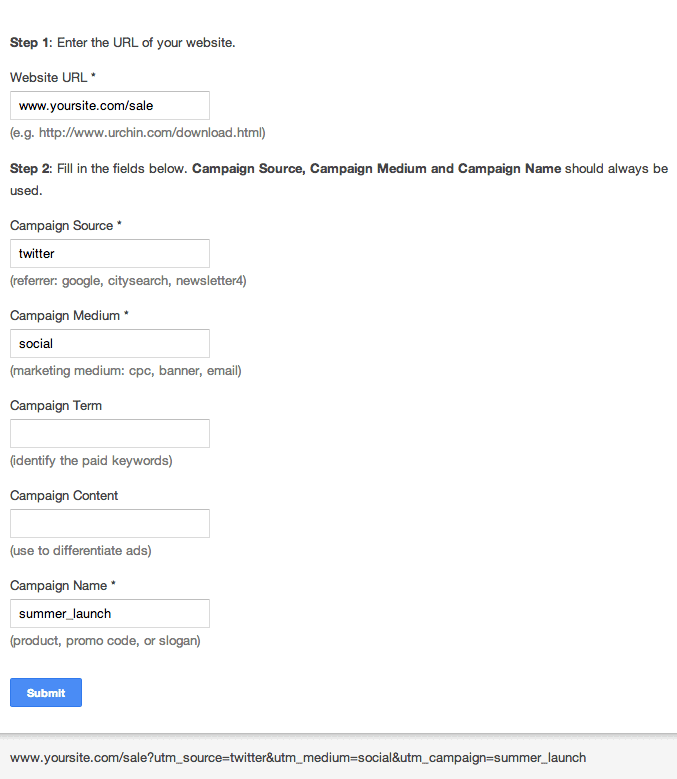 When talking about UTM campaign tagging, most blogs only mention Google URL builder. But it’s worth exploring a few other tools, some of which not only help you build, but also manage your UTM tracking URLs. 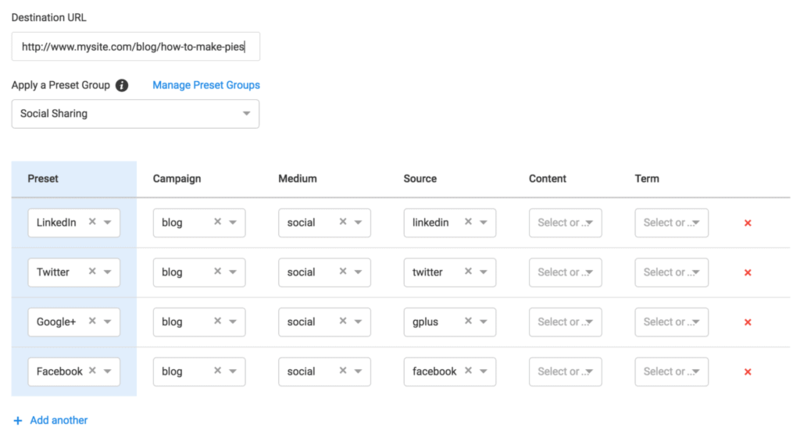 You can then choose the best tool for your marketing campaigns considering your analytics requirements, team size, risk tolerance, and budget. Let’s look at some analytics URL builders from the most basic to the most advanced. This is not really a tool, but it’s still a commonly used method for building tracking URLs. It is also the most primitive way to build URLs. You have a high chance of making a mistake — even if you know everything about URL formats. I can’t imagine why you would ever use this method. You will notice that a question mark (?) separates the actual URL and the first parameter while ampersand (&) separates the other parameters. This is the most popular URL builder tool out there. It’s the first to come up in search results and most blog posts on UTM tracking talk about it. That’s why many people think that it’s the only URL builder out there. Or maybe they think that since it’s by Google, it must be more correct than others. They might even believe that it helps Google Analytics recognize their campaign parameters. But that’s not true. There are better builders out there as we will soon see. Does not automatically shorten URLs. As soon as you need to tag more than a handful of URLs, it’s better to start saving them along with their campaign parameters. For this purpose, spreadsheets are an obvious choice. You can either go with Microsoft Excel or Google Spreadsheets (preferred). If you are a serious marketer, you should keep track of your URLs. Combined with a good tagging strategy, it can enable you get accurate analytics reports. You can then compare your traffic and conversion numbers across different mediums, sources and even year-over-year. You can gain a lot of insight from such comparisons. Without saving your campaign parameters, you cannot implement any tagging strategy consistently. There are many spreadsheets templates available online for campaign tagging. If you decide to go with the spreadsheet option, you could try free Google Analytics URL Builder Spreadsheet. Cannot handle anchor tags, e.g. example.com#top, because of URL parsing limitations of a spreadsheet. Cannot URL encode arbitrary UTM values. This can result in invalid URLs. 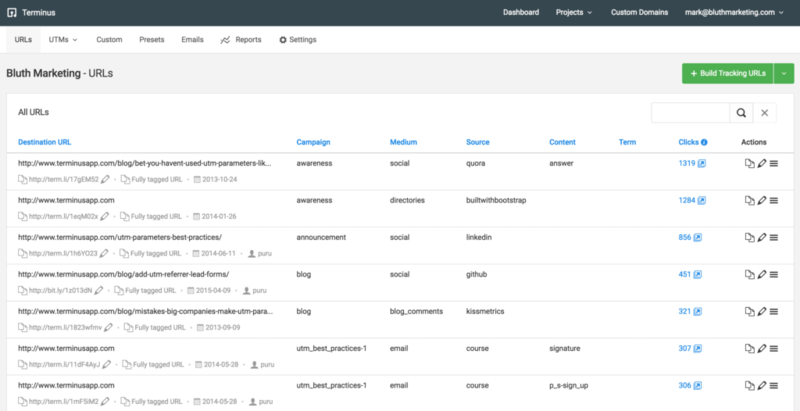 Terminus, like spreadsheets, helps you build and manage UTM tracking URLs, but also has a several other convenient features. It also hides the nitty-gritty details of maintaining a spreadsheet. 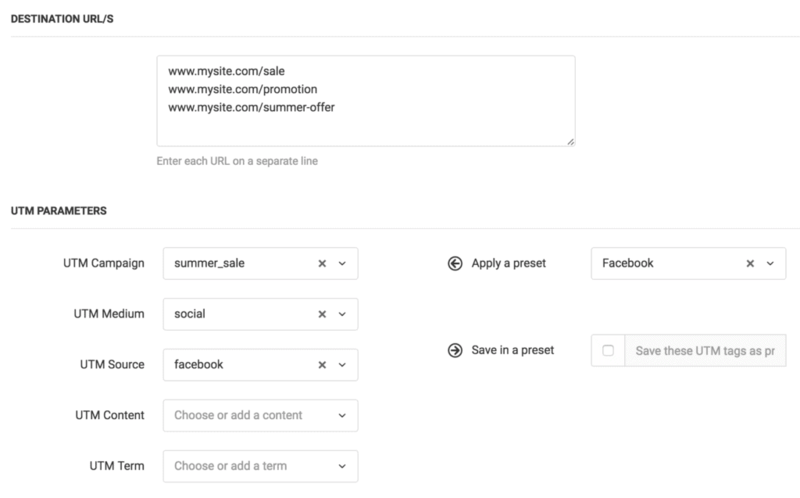 You can also save the combination of UTM parameters in a preset. It can then be used to quickly tag new URLs with the same set of parameters. If you need to add multiple sets of UTM tags to a URL, say you are publishing a new blog post, you can do it in as little as two clicks. 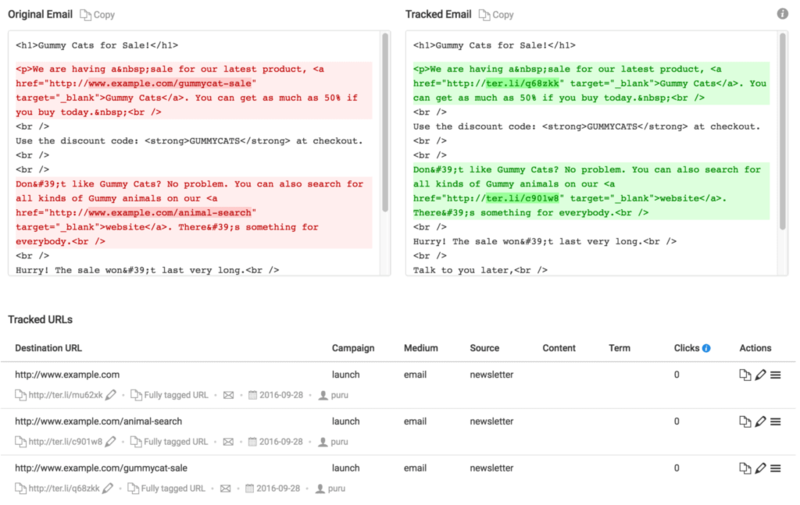 You can even quickly add UTM tracking to all the URLs in your emails and generate a fully UTM tracked email in seconds. 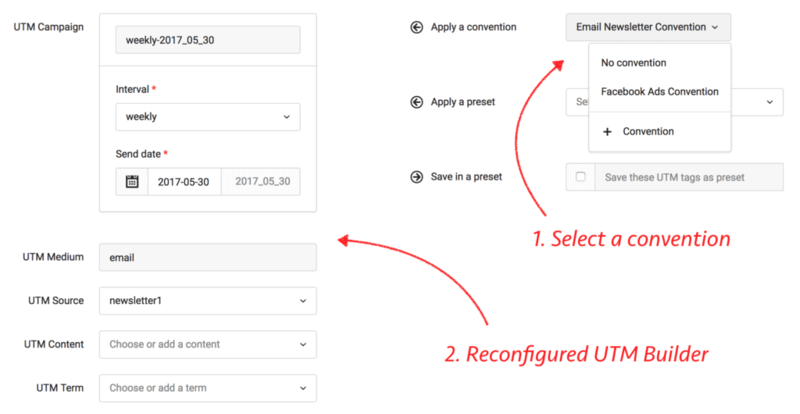 With Terminus, it’s possible to make your UTM conventions part of your URL builder. Define as many conventions as you like. No need to remember them anymore. Many other features like custom parameter, presets, preset groups, redirect codes, clicks reports, audits, etc. Start your 21-day free trial to find out if it works for you and your team. Cancel with one-click. There’s zero risk. I’m sure there are more such tools out there. Once you understand your needs and the capabilities of these tools, you will be able to choose one with confidence. Having said that, all of the above tools are just that. Tools. Without a coherent and consistent strategy, all your UTM tagging will fall apart and you may even ruin your traffic reports.